Thanks @Subrahmanyam for your response. As of now we managed the class issue. Below is our BOT ontology. "I can do following things for you and provide all ontology child nodes in response if they click on that node it will go to answer of that node"
FYI, I gone through all standard response but it is having only list of FAQs, not ontology child nodes. Could you please help us to achieve this functionality? Configure a dialog intent not found in your bot of type hidden. At intent not found dialog, have a message node to present a template which shows the Nodes at KG as elements to the users. During runtime, when the intent is not identified by the bot, the intent not found dialog is executed and the message template is presented. Based on the user selection of the node, the payload as configured at the element as is sent to bot and the response is delivered to the user. 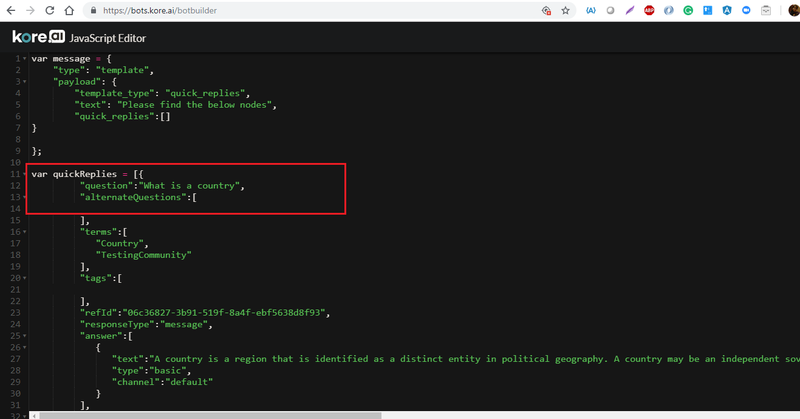 The reason I ask you to send FAQ or terms as payload at nodes of the template is that, ontology is based on the number of terms present in the user utterance to identify the path and passing only the node name shouldn’t be of much help. I have created hidden dialog intent with name “intent not found” and this dialog is associated to one message node. But not able to find the way, how message node can present a template which shows the nodes at KG as elements to the users. STEP-1: Getting the Ontology structure. In the Knowledge collection, you will have an “export” option on the top-right corner menu. Export as a JSON file. STEP-2: Integrating the Knowledge collection data with a message node. In the respective bot, create a new dialog task named “Intent not found”. Open advanced settings and select "Hide from Help ". 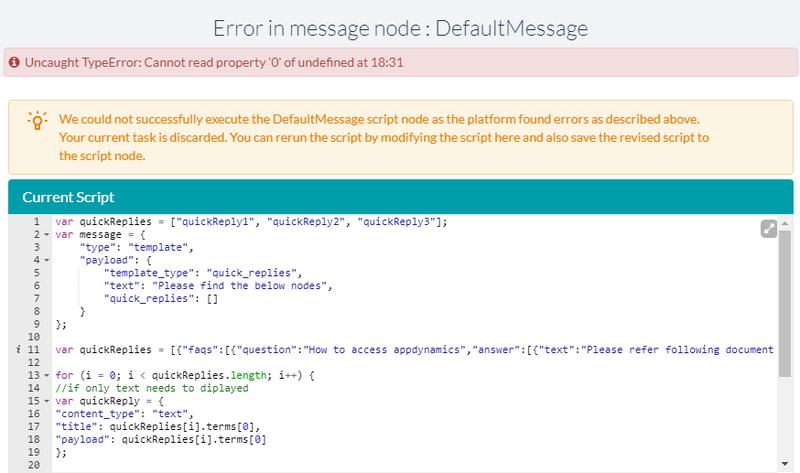 In this dialog task, add a new “message node” after the default “user intent” node. Open “Manage Responses” in the “Message node” settings. Add a default message for “All channels”. Then click on “Add Bot response”. Select the Channel as “Web/Mobile Client”. You may observe that the “payload” object, provide a value to the “text” key. (You can write a message which you would want to display). You can observe a for-loop, change the title to “quickReplies[i].terms” . Ideally, the Knowledge collection will have the node names as the first element in the “terms” array. Hence, to display node names, we have selected the above snippet. (You may traverse the JSON as per your requirement). Let us know if you need any further clarification on the above. Thanks @yogaramya.mendu for your detailed steps. We observe from the screenshot that the Knowldge graph JSON structure provided to the quickReplies variable has the faqs Array first and in this array, the questions and answers are provided. We request you to remove the faqs array(quickReplies expects the Array of objects directly) and please make a note of the brackets to be removed at end of the JSON. Let us know if you need any further clarification. I am able to get ontology child nodes in different way as a response if intent not found. This is the output. Email node is having all Path Level Synonyms along with Child node name. I need only child node Email as a response, not along with synonyms. Could you please help me on this to get desired response. Further I have removed the path level synonyms from JSON and getting required output. Could you please suggest how we can modify our response to get it in List view instead horizontally. I have tried list template but not able to get required output. We have checked with the list view template. The provision to display a KG answer as we click on a list item is not possible as the list item expects a URL and the “defaultAction” type cannot be changed from “Web-Url”. Hence, the above scenario of displaying the KG nodes in a list template and view the KG response on clicking it is not possible as of now. We will communicate these use cases to our engineering team for further action on the message templates. Also, there is no provision to display quickReplies vertically as list. The template is pre-defined and cannot be modified. @shobhit1.singh The developers have the provision to configure custom templates for displaying at webSDK . Please refer to the below topic for more details. Dear Madhu, can we make a check-boxes for the multiple selection. OR do you have any other way in which we can make a check box to select the multiple value together and pass them to the bot .